4 people have been here. 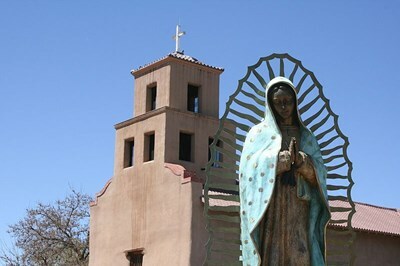 Santa Fe is the capital of the state of New Mexico. 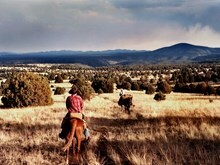 It is the fourth-largest city in the state and is the seat of Santa Fe County. Santa Fe (literally 'holy faith' in Spanish) had a population of 62,203 at the April 1, 2000 census; the estimate for July 1, 2009, is 73,720. It is the principal city of the Santa Fe, New Mexico Metropolitan Statistical Area which encompasses all of Santa Fe County and is part of the larger Santa Fe-Española Combined Statistical Area. White Sands is a census-designated place (CDP) in Doña Ana County, New Mexico, United States. The population was 1,323 at the 2000 census. It is part of the Las Cruces Metropolitan Statistical Area. See also White Sands Missile Range and White Sands National Monument. The Albuquerque International Balloon Fiesta is a yearly festival of hot air balloons that takes place in Albuquerque, New Mexico, USA during early October. The balloon fiesta is a nine day event, and has around 750 balloons. The event is the largest hot air balloon festival in the world. Roswell is a city in and the county seat of Chaves County in the southeastern quarter of the state of New Mexico, United States. The population was 45,293 at the 2000 census. It is a center for irrigation farming, dairying, ranching, manufacturing, distribution, and petroleum production. It is also the home of New Mexico Military Institute (NMMI), founded in 1891. Bitter Lake National Wildlife Refuge is located a few miles northeast of the city on the Pecos River. Petroglyph National Monument stretches 17 miles (27 km) along Albuquerque, New Mexico's West Mesa, a volcanic basalt escarpment that dominates the city’s western horizon. Authorized June 27, 1990, the 7,236 acre (29.28 km²) monument is cooperatively managed by the National Park Service and the City of Albuquerque. The western boundary of the monument features a chain of dormant fissure volcanoes. The Loretto Chapel in Santa Fe, New Mexico is known for its unusual spiral staircase, an exceptional work of carpentry. The construction and builder of the staircase are considered miracles by the Sisters of Loretto and many who visit. 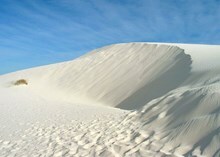 White Sands National Monument is in the northern Chihuahuan Desert in the U.S. state of New Mexico. It's known for its dramatic landscape of rare white gypsum sand dunes. Trails through the dunes include the raised Interdune Boardwalk and the Dune Life Nature Trail, dotted with interpretive exhibits on wildlife and other features. The Albuquerque International Balloon Fiesta is a yearly festival of hot air balloons that takes place in Albuquerque, New Mexico, USA during early October. 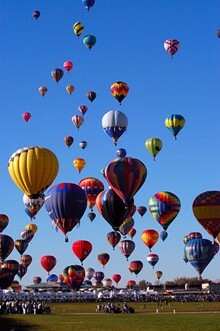 The balloon fiesta is a nine day event, and has around 750 balloons. The event is the largest hot air balloon festival in the world." New Mexico's Pecos River begins on the western slopes of the Sangre de Cristo Mountains. It's a 926 mile long tributary of the Rio Grande River. Just over twenty miles of the Pecos River, from the headwaters to Tererro, is designated as a National Wild and Scenic River. 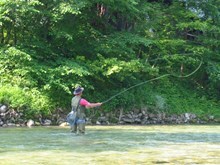 Fly fishing the Pecos River requires some hiking to get to the best water."